The kale harvest is nigh, and we’ll talk about roasting and sauteing in a future post. Right now we’re talking about T-shirts, and Chick-fil-A, and law suits. First, the T-shirts. 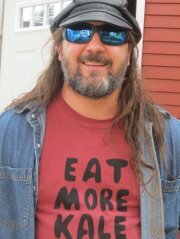 You can buy a cool Eat More Kale T-shirt from Bo at Vermont’s One-of-a-Kind T-Shirt Designs. The shirts have become very popular with foodies and gardeners, and they’re selling like hotcakes all over the world. I know you want one. Now, there’s the question of Chick-fil-A. The fast food restaurant powers-that-be seem to think there’s the possibility that consumers will confuse Eat More Kale with the Chick-fil-A slogan, Eat Mor Chikin. The have chosen to press their suit in the courts. Watch this video to learn more about kale and what’s the deal with Chick-fil-A. Quite. I’ll be sharing more on kale chips in an upcoming post. Stay tuned.